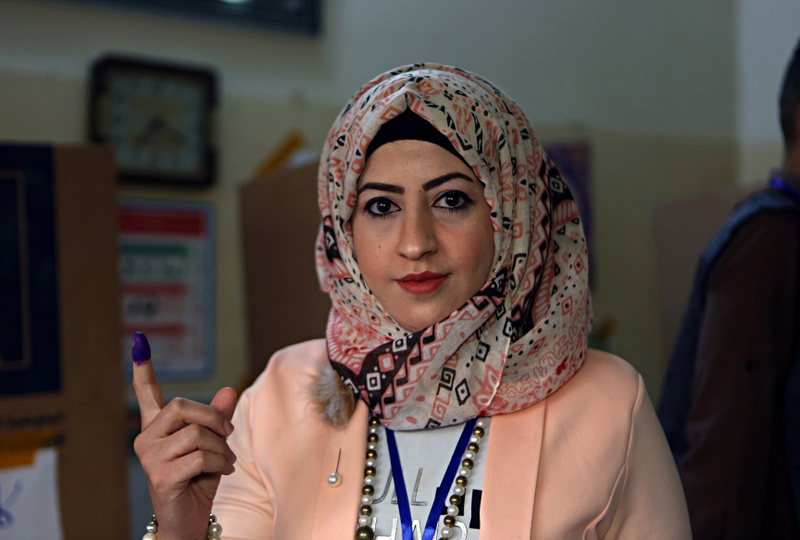 BAGHDAD (AP) — Polls opened across Iraq on Saturday in the first national election since the declaration of victory over the Islamic State group. After weeks of official campaigning, no clear front-runner has emerged as Prime Minister Haider al-Abadi faces stiff competition from political parties with closer ties to Iran. Al-Abadi "took revenge" for civilians killed in insurgent attacks in Iraq "with the victory over Daesh," said 71 year-old Felihah Hassan, using the Arabic acronym for IS. With support from the U.S.-led coalition and Iran, al-Abadi oversaw a grueling war against the extremists and declared victory over the group late last year. Since then, Baghdad has experienced a relative lull in insurgent-style attacks, but in the lead up to Saturday's vote Iraqi security forces have imposed tight security measures including a curfew. The prime minister's most powerful opponents are his predecessor, Nouri al-Maliki, and an alliance of candidates with close ties to the country's powerful, mostly Shiite paramilitary forces. The alliance, called "Fatah" — Arabic for "Conquest" — is headed by Hadi al-Amiri, a former minister of transport who became a senior commander of paramilitary fighters in the fight against the IS group. Many of the candidates on his list were also paramilitary commanders before they cut their official ties with the force in order to seek office. Jassim Mohsen, 58, who fought against IS with the paramilitary forces, said he's casting his vote for the alliance because of their personal sacrifices. Another key player in the vote is Influential cleric Muqtada al-Sadr. He commanded fighters in the war against IS and headed a powerful militia that fought U.S. forces in Iraq before that, but his election campaign has focused on social issues and eliminating government corruption. The vote will be conducted electronically for the first time in an effort to reduce fraud and polling centers have been set up for many of the country's 2 million people who remain displaced by the war against IS. The results of Saturday's election are expected within 48 hours of the vote, according to the independent body overseeing the election. Government formation negotiations are expected to drag on for months after that as the dozens of political parties attempt to cobble together a political bloc large enough to hold a majority of seats in parliament.